Arizona luxury home buyers place themselves at financial and legal risk when there is a less-than-clear understanding of the relationship they need, or have, with agents. For buyers of Scottsdale luxury real estate looking to find their dream home, negotiate the best home price, receive the highest levels of personalized service and protect their legal rights, it is critical to understand the form of representation a broker or agent is providing, and what representation is in their best—and worst—interests. There are too many critical nuances in Arizona luxury real estate—nuances that a Scottsdale exclusive buyer’s agent knows best. 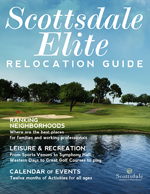 It takes a fully licensed, credentialed Realtor® who also is a specialist in gated luxury home real estate to understand the intricacies of the Scottsdale luxury real estate market for those both in state and out of state—thereby giving the Scottsdale luxury home buyer the distinct advantage.